Money, in and of itself is not a bad thing but how you go about getting and using it can certainly be a bad thing. For career politicians, easy money is a very real and very serious temptation. For politicians with a sympathetic media, the money problem becomes enormous. Hillary may not have an adoring press at her beck and call, but she has the media playing on her team. When the government watchdogs, the media, and the corrupt politicians are all playing on the same side not only does the problem grow exponentially but it remains unchecked. The media and the Obama administration view Hillary as a crook, but she is their crook. The founding fathers were brilliant to set up a two parties that view the growth, creation and the use of government very differently. There are only two ways which Hillary can be stopped. If the opposing teams wins the trophy than we can expect an investigation into the Clinton Foundation. This will at least give her pause to slow down behavior that is either borderline illegal or downright illegal. The other scenario is that Hillary feels invincible and shoots herself in the foot with illegal donations and payouts from the questionable Clinton Foundation. 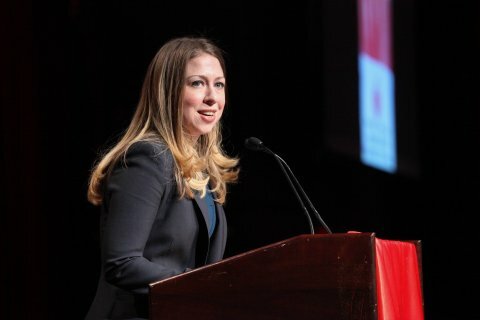 Politico published on the previously unknown and "closely held" details of former First Daughter Chelsea Clinton's contract with NBC News was obscenely lucrative and bizarre unless something else was going on. According to the story, Clinton was given an annual salary of $600,000 when she joined NBC News as a "special correspondent" in November 2011. Based on these figures, Clinton has earned about $26,724 for each minute she subsequently appeared on air. NBC News declined to confirm Politico's report about Clinton's salary. A spokesperson for the news outlet instead said they, "don’t comment on details of existing contracts." Politico also said Clinton's contract "was up for renewal or nonrenewal this year" and she was placed on the payroll on a month-to-month basis to allow her to cut ties with the network if her mother, Hillary Clinton, launches her long rumored presidential bid in 2016. Assuming Politico's reporting is correct and that Clinton is still earning at the same rate after moving to month-to-month payment, she has earned about $1.55 million from NBC News. NBC News did not respond to multiple requests for comment from Business Insider asking for information about Clinton's salary or the number of appearances she has made since becoming a special correspondent. However, using Nexis, Business Insider identified 14 appearances Clinton has made on NBC News programs. A source familiar with Clinton's work for NBC told Business Insider "she has two completed reports scheduled to air next week and another two scheduled to begin shooting in the coming weeks." Clinton's 14 past appearances identified by Business Insider included news segments where she interviewed the Geico gecko and feel-good "Making a Difference" pieces like one on foster grandparents and another on a program to provide therapy dogs to soldiers. She was also interviewed by other NBC reporters about her charity work and role in President Barack Obama's inauguration. In total, Clinton's segments from the past 2 years and seven months lasted just shy of 58 minutes. This means, based on our analysis, Clinton earned $26,724 per minute she was on air. That amounts to $445 per second. In other words, it's good to be a former (and potential future) First Kid.